LEAFHouse, UM's 2007 entry in the Solar Decathlon competition. 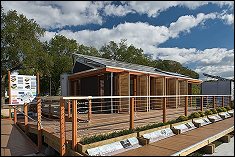 The University of Maryland has been selected to continue in the second stage of the proposal process for the U.S. Department of Energy Solar Decathlon 2011. Along with a selection of other universities, UM is preparing a concept design submission for this next stage of the team selection process. The concept submission is due mid-March, with final notification of selected teams anticipated to be occurring mid-April. The 2011 competition, hosted on the National Mall, will take place in October of 2011. LEAFHouse, UM's Solar Decathlon 2007 entry, took second place overall, and first or second place in five of the individual contests. LEAFHouse also won the Peoples' Choice Award and several industry awards presented at the competition including: the American Society of Heating, Refrigerating and Air-Conditioning Engineers award for "Integration for Renewables for Sustainable Living" and the National Association of Home Builders (NAHB) NAHB Marketing Curb Appeal First Place Award. LEAFHouse went on to win two American Institute of Architects (AIA) chapter awards: the AIA Potomac Valley Chapter Special Award for the "Advancement of the Art and Science of Architecture" and the DC AIA/Washingtonian Award for Distinctive Architecture. The house was also cited by the Institute of Electrical and Electronics Engineers in 2008 with a Special Chapter Award. Most important to the mission of the Solar Decathlon, on January 21, 2008, LEAFHouse team members were invited to the Maryland State House to receive binding resolutions from the state Senate and House, commending their work. UM also participated in the 2002 and 2005, showcasing entries that received significant praise and a host of awards. The 2002, 2005 and 2007 Solar Decathlons were an excellent learning experience for the UM team--students, consultants, faculty members, and constituents of the University and regional communities. Building on these successes, UM has a strong design, construction and organizational basis for an entry into the Department of Energy's 2011 Solar Decathlon. At UM, the 2011 Solar Decathlon has generated interest from all over the campus community and drawn together a multidisciplinary team of enthusiastic students and faculty. In September 2009 alone, over 250 students from schools and departments across the campus signed up as potential team members. While team members come from a wide range of fields and bring various levels of experience and expertise, all share the common goals of producing a sustainable design with sustainable construction. The team members show their concern for the environment, and have a passionately held conviction that we must change the way buildings are conceived,designed and built, and for fostering integrated practice necessary for future practitioners who will be charged with creating built environments and who must cross generational and academic – industry boundaries to do so. The UM team intends to use the Solar Decathlon as an opportunity to provide a hands-on learning experience to students and a tool for educating the public about environmentally sound,sustainable design and the role of advanced building strategies and renewable energy technologies in achieving a future powered by alternative energy strategies. A core Faculty Leadership Advisory Team has been formed with faculty continuing to join. Coordinated courses have been formed in the Schools of Architecture, Planning and Preservation; the A. James Clark School of Engineering, and College of Agriculture and Natural Resources. These courses are in progress this semester, proceeding with the design of UM's next Solar Decathlon house. Interested students and faculty members are encouraged to get in touch with the SD2011 team! Please contact: Associate Professor Amy E. Gardner or Associate Professor Keith Herold. For more information about the U.S. Department of Energy Solar Decathlon Competition see www.solardecathlon.org. Article submitted by Professor Amy Gardner, UM School of Architecture, Planning and Preservation.